A traditional recipe from my mother in law’s diary. An old diary with a paper sticking out with something written in Urdu caught my attention one day as I was cleaning some old papers. 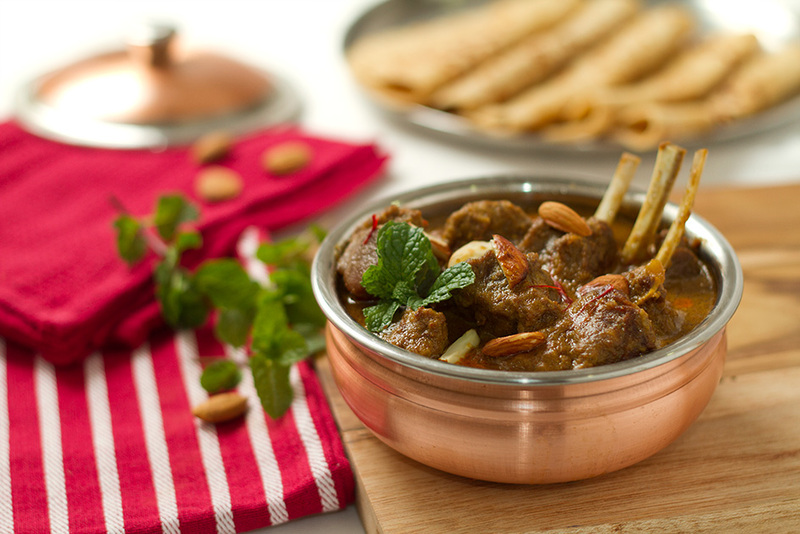 It was a recipe of Mutton Korma with Almonds, Saffron and lots of aromatic spices. It was titled Badam Zafrani Korma, perhaps given to my mother in law by some relative. With great excitement I read the recipe and decided to make it that evening itself. The use of dry fruits and saffron in meat dishes is not new to Mogulai cuisine. It is said that the Moguls loved to eat and often experimented with food. This rich aromatic Korma tastes equally good with Indian breads as well as Rice. The word “korma” is derived from Urdu ḳormā or ḳormah, meaning “braise”, derived in turn from Turkish kavurma, literally meaning “cooked meat”. Korma (قورمه in Persian) has its roots in the Mughlai cuisine of modern-day India and Pakistan. It is a characteristic Mogul dish which can be traced back to the 16th century and to the Mughal incursions into present-day Northern India, Pakistan and Bangladesh. Classically, a korma is defined as a dish where meat or vegetables are braised with water, stock, and yogurt or cream added. The technique covers many different styles of korma. Soak the almonds, remove skin and make a paste. Lightly roast poppy seeds and dried dessicated coconut and make a paste. Heat oil and fry cinnamon and green cardamoms. Add ginger and garlic pastes and fry them for about 15 seconds. Add the mutton to the oil and fry till the water evaporates and the mutton becomes nicely brown. After the mutton browns, add the curd mixture and keep frying till the masalas get well fried and oil starts to float on top. This process is called Bhunna (भूनना) in Indian cooking parlance. Keep sprinkling water so that nothing sticks to the bottom of the pan. This process may take anything between 25-30 minutes. Add two cups of warm water and cover the pan (I use a pressure pan). Let the mutton cook under pressure for about 35 minutes. Let the pressure drop and add fried onions, mint leaves, and green chillies. Mix lightly and let the gravy boil for a couple of minutes till the oil floats on top. Stir in the saffron and milk mixture, and switch off the gas and let the gravy stand for about 15 minutes. Garnish with mint leaves. Serve the Badam Zafrani Korma with Nan, Roomali roti or parathas. Steamed rice also goes well with it. I’ve just gone through the recipe ” BADAM ZAFFRANI MUTTON KORMA ” very fascinating ! The waY it was described in step by step it has become tad easy even who has never cooked . I felt as if , at the end of reading , the the Mutton is ready to eat for me now only. Great! Keep it up with many more innovative recipes in future. Wonderful recipe. I am going to try this for sure. Bookmarked. Thank you. Do post a picture on Facebook if you like the dish after you make it.